Crock-Pot Express Crock Programmable Multi-Cooker Review – Best Priced Multi-Cooker For You? Is the Crock-Pot Express Crock Programmable Multi-Cooker the best-priced multi-cooker? 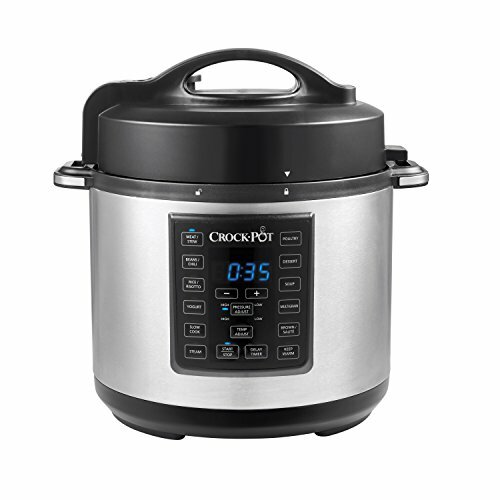 Here is my review of this low priced crock pot multi-cooker. Read and decide for yourself. Find out if this small kitchen appliance best suits your needs. Crock-Pot is synonymous with slow cookers and is a well-respected brand with products that other companies copy. Now, with the with the Express Crock Programmable Multi-Cooker, they have jumped into the multi-cooker market. In order to accomplish this, it meant copying the very successful Instant Pot. It comes with a 6-Qt. removable, dishwasher-safe, metal pot with non-stick coating for easy cleanup. The newly introduced Crock-Pot Express Crock Programmable Multi-Cooker is very versatile with features that many other multi-cookers in its price range don’t have, for example, the sauté/browning and yogurt functions. Also, it has a countdown, time delay function that allows cooking to start later. You don’t have to be there to start cooking at a certain time. Use brown/sauté to brown meat in the same pot that it will be cooked in. Thus, avoiding another piece of cookware to wash.
Cooks quickly, as a pressure cooker, or slowly, as a slow cooker. The choice, in most cases, is yours. See the cooking guide above. Although it doesn’t have a manual control button, you can use the Beans/Chili function to adjust the pressure to LOW or HIGH and set cook times from 5 minutes to 2 hours. To keep contents ready to eat after cooking is complete, the Crock-Pot Express Crock automatically switches to “Warm” to prevent overcooking while keeping contents at serving temperature. Also, it is attractive enough to leave on your countertop. Comes complete with a recipe book, steaming rack, and serving spoon. If you receive this code while cooking, it means that the Express Crock was unable to generate enough steam to pressurize completely. 1. Make sure that the Steam Release Valve is turned to the closed or “Seal” position. If it was not in the correct position, then rotate it to the correct position and jump to step 3 below. 2. If the Steam Release Valve was in the correct position, then turn it to the “Release” position and wait for the unit to de-pressurize. Then remove the lid and look underneath it to make sure the Sealing Gasket (large rubber ring) is properly secured to the underside of the lid. 3. Add another cup of liquid (water, broth, etc) to the cooking pot, stir your ingredients, and reattach the lid, making sure the Steam Release Valve is in the “Seal” position. 4. Unplug the unit for at least 5 seconds, and then re-plug it in and re-program your cook settings to begin cooking. What Is The Crock-Pot Express Crock Programmable Multi-Cooker For? Do you want an all-in-one appliance that replaces most of your most used small kitchen appliances without giving up cooking quality or taste? If you are looking to replace your pressure cooker, slow cooker, rice cooker, steamer, browning/sautéeing pan, and yogurt maker with one convenient, low-cost, small kitchen appliance than the Crock-Pot Express Crock Programmable Multi-Cooker is for you. Read some of Amazon customers reviews below. 79% give the Crock-Pot Express Crock Programmable Multi-Cooker 4 or 5 out of 5 stars for an overall average of 4.2 stars. The Crock-Pot Express Crock Programmable Multi-Cooker fulfills expectations perfectly, doing the job of several other small appliances with less counter space, high efficiency, high quality, ease of use and ease of cleaning. I give the Crock-Pot Express Crock Programmable Multi-Cooker 83 out of 100 and a recommended Buy. Looking for something else? Try my Multi-Function Cookers page. Do you have a Crock-Pot Express Crock Programmable Multi-Cooker? What is your opinion? Please leave your comments or questions in the comment box below.